I know the Pomodoro technique long time ago, but I have always been rather reluctant to use it. After seeing how widespread is this technique in the world of programming and how it is recommended by some well-known developers, I think I was just having too many prejudices. In any case, trying it for a few days would not hurt me. If it did not work for me, I would not use it anymore. 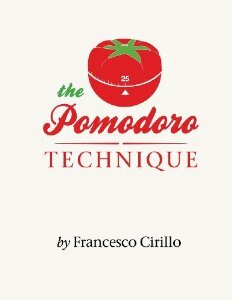 First, for those who put all productivity stuff in the same bag, the Pomodoro technique is not a personal productivity system like GTD, and therefore, is not an alternative. It is just a technique that allows you to achieve a greater focus on getting things done avoiding all interruptions. If you are a GTD practitioner, using Pomodoro can come in handy to enhance the final stage of this methodology: DOING. You set a standard kitchen timer (ideally, tomato-shaped) for 25 minutes. I still have no such timer, so I am using Tomatoist, an online application that emulates it. While the timer is running, you let nothing interfere with your work. If someone calls you, tell her you will call back in a while. Any interruption must be deferred to the end of the 25 minutes. When the tomato sounds, you stop what you are doing immediately and take a break for about 5 minutes, where you can deal with any interruption that happened during the previous 25 minutes. You set the timer for another 25 minutes and start again. Every four pomodoros you take a longer break of 15 to 30 minutes (I am not very masochistic, so sometimes I take up to an hour). Each 25-minute block is extremely productive. When you start a pomodoro you acknowledge you are activating a total productive mode and the temptation to procrastinate almost disappears. Since it is a relatively short time, you know that at the end of the period you will deal with those little things that command your attention. The 5-minute breaks, far from making me lose focus, are very helpful. I get up, do something different or just look out the window, but the fact is that at that time my ideas are put in order so I can continue the next pomodoro even more focused. The estimation of what I can do in a day is much more real, so is the feeling of how much productive I have been. I do not use time units for estimates now, but pomodoros. I know that a task can take 4 pomodoros and another one would take 2. I also know that if I make 12 pomodoros in a day I would be very, very productive. Maybe it has been just the novelty, but for now it seems to me a highly recommended technique. Anyway, I will continue using it and will tell you my feelings. Writing, editing and translating this post into English has taken me 5 pomodoros. I love the Pomodoro technique, and after getting used to it have really noticed it's a great way to get yourself ramped up into productivity. On top of creating a list of daily pomodoro routines, I have been doing what I call a Pomodoro Pyramid technique, basically scaling up and down in a series of Pomodoros in correlation to the mental processing level needed for tasks. Hi @Daman. The more I use this technique, the more confident I am of its usefulness. Wow, your Pomodoro Pyramid technique sounds very interesting, though sort of advanced for me at the moment.